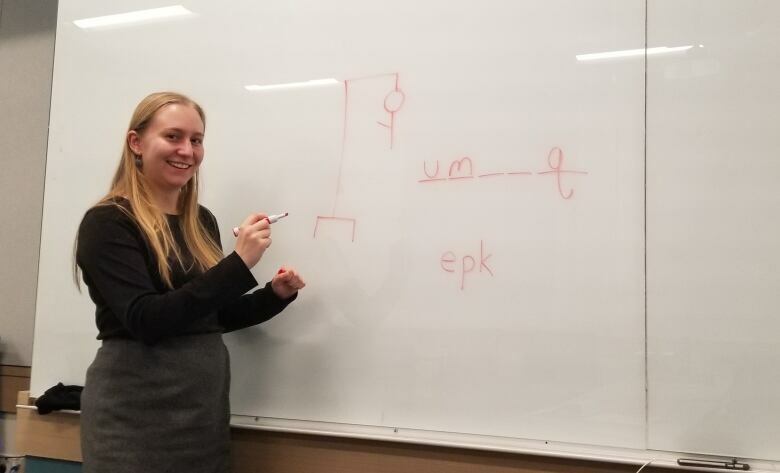 At least a dozen students who have passed through the University of Washington in the last decade have some fluency in Inuktitut, thanks in part to investments in language education prompted by the launch of Sputnik. Based in Seattle, the university's Canadian Studies Center manages language scholarships, and while most students at the centre choose to learn French, about 10 years ago, Tim Pasch, a student with an interest in the Arctic applied to learn Inuktitut. With the help of the centre's managing director Nadine Fabbi, Pasch made a case to the United States Department of Education for funding the study of Inuktitut. "Our argument was that it's critical, especially given all of the geopolitics today, that our students understand about the North," Fabbi said. Other students have applied to study Canadian Indigenous languages and have been successful. Fabbi said that's because international relationships are changing. She said good relations with Canada require an understanding of the Indigenous cultural perspective on issues such as pipelines, softwood lumber and marine resources management. The Soviet Union's successful launch of the Sputnik satellite in 1957 pushed the U.S. government to pour money into the country's education system. "The U.S., as we all know, was very concerned about the thought that they were not the first in space and that the U.S., therefore, was not as competitive as it wanted to be," Fabbi said. After the launch, federal money was earmarked to support math, science and foreign language programs. In addition to securing funds, the university needed to find someone to teach Inuktitut. It ended up connecting with former long-time Iqaluit resident Mick Mallon and his wife Alexina Kublu. Most of the classes are taught via Skype, but students have travelled to Nunavik, Iqaluit and more recently to Victoria, where Mallon and Kublu now live, to spend time with the teachers. Most students don't spend enough years at the centre to become fluent, but at least two students became mostly fluent, according to Fabbi. Classes run for an hour and a half twice a week. Pasch, one of the Inuktitut-fluent students, is now a communications professor at the University of North Dakota, where he researches digital communication in the Arctic.